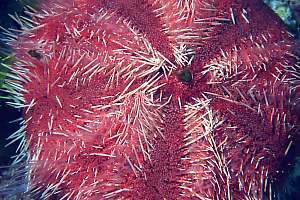 The echinoderms (prickly skins) comprise the sea urchins, starfish and sea cucumbers. 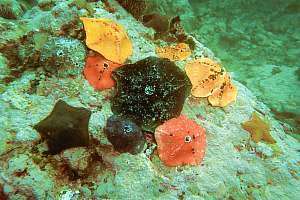 They have evolved into a great variety of shapes and living styles. 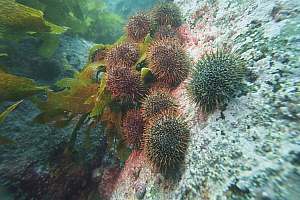 f001319: urchins (Evechinus chloroticus) have cleared an area, and other grazers move in. In the background the sturdy and powerful grazers, the Cooks turband shell (Cookia sulcata), grazing into the bushy form of the stone-leaf alga, also called pink paint (Lithothamnion). 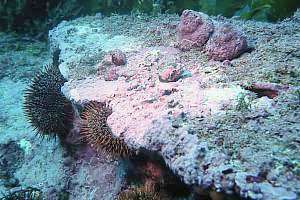 The smooth bits are grazed by top shells, catseye (Turbo smaragdus) and radiate limpets (Cellana radians), all just visible under their coats of pink paint. 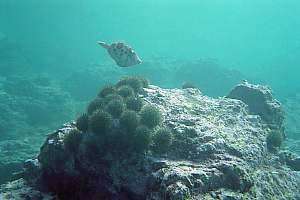 f001932: where the rocks slope gently inside the urchin's habitat zone, one may find large barren areas like the one shown here. 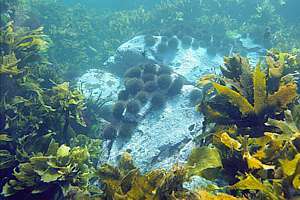 Some urchins have clustered on the sheltered side of the rock, but a leatherjacket visits them for a nip at their tubefeet and spines. Although the rocks look barren, they are nevertheless highly productive, as borne out by the numerous other grazers found here. f006828: the last Mohican? 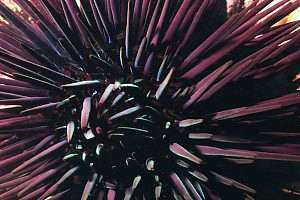 Evechinus chloroticus f019724: an urchin has climbed halfway up a stalked kelp where it will bite through the stipe, bringing its crown down. 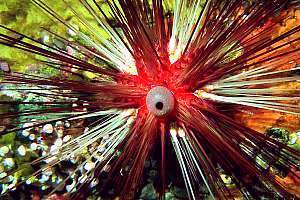 The urchin's five-pronged teeth are only just visible. 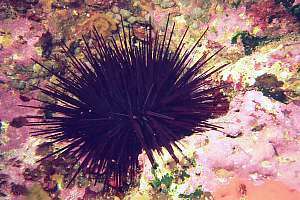 f020710: a juvenile needle urchin has five white sectors. 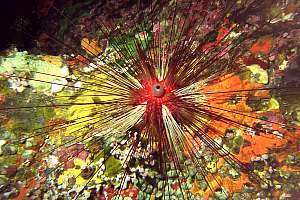 Here it is seen browsing over a tapestry of carpet sponges. 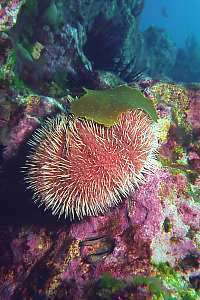 These urchins do not graze , but they catch live prey inside their very agile spines. 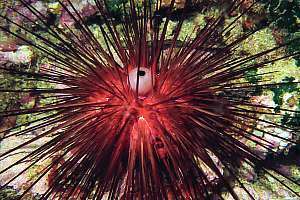 f020712: closeup of the juvenile needle urchin shown left (Diadema palmeri). 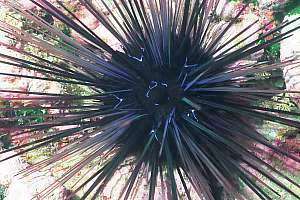 f020137: f030417: the blue needle urchin is rarely seen. 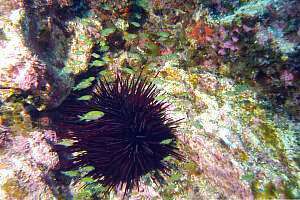 f030424: in this closeup of the purple urchin the purple colour and greenish sheen can clearly be seen. 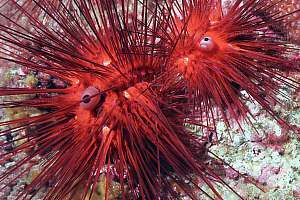 Centrostephanus rodgersii f029818: this white-spined urchin is occasionally found around our offshore islands (Tripneustes sp?). 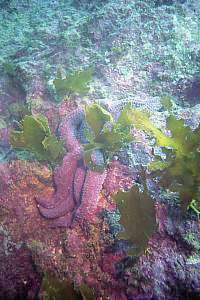 It stands out by the sheer density of its red tube feet. 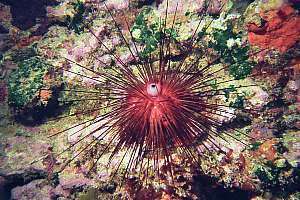 f029825: the white-spined urchin is found from 3-25m, covering a wide range and an equally wide range of diets. 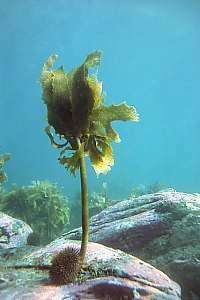 Rather than grazing on barren rock, it prefers the lush growth of fleshy seaweeds like sea lettuce and stalked kelp. Here it is seen hoarding its next meal on its back. Deeper down it climbs the kelp to feed on its fronds. 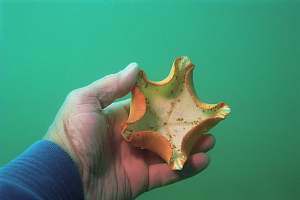 f004901: the ambush star or elevated cushion star (Stegnaster inflatus) has a peculiar but effective way of catching prey. By standing tippy-toed on its five arms, it forms an apparently safe shelter underneath. The catseye snaill in the foreground might be tempted to walk in. 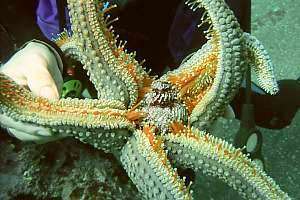 But as soon as the star's belly is tickled, it closes its web like the curtains of a stage, trapping the animal inside. Rasplike protrusions on its belly, move the victim further towards the stomach in the middle, as it fights to escape. This animal catches snails, crabs, shrimps, seahorses and small fish. f014730: a collection of ambush stars, brought together to show their range of gaudy colours. 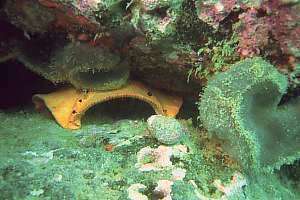 For good measure, two common cushion stars (Patiriella regularis) are part of the scene. [A6] f004904: When removed from its site, an ambush star curls its cardboard-thin web, which makes it more difficult to be eaten. 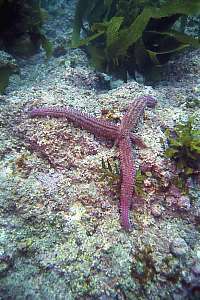 f010702: a seven-armed star has suffered size reduction by the predating trumpet whelk (Charonia) who specialises on sea stars. 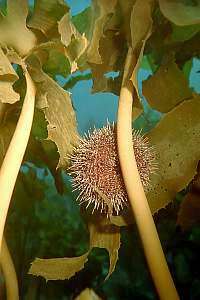 After giving a star chase with large steps, the trumpet whelk pins it down with its large siphon, then steps onto the immobilised arm. 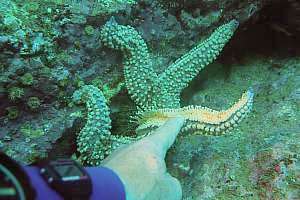 Realising it has been trapped, the starfish then sacrifices its arm, running away with the others. 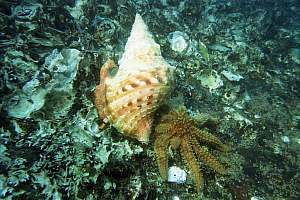 But the trumpet whelk is persisten in its hunt, as this star has found out, but some of its arms are regrowing already. Astrostole scabra f017234: a trumpet whelk (Charonia lampas capax) has just pinned down an eleven-armed prickly star with its siphon (Coscinasterias calamari), and is now going to place its large foot onto the caught arm. The victim has already lost one arm, which has started to regrow. This story had a happy ending because the uneven topology of the oyster bed, allowed the star to escape. The star shape enabled the victim to run faster on this rough terrain, than the whelk could with its heavy shell. 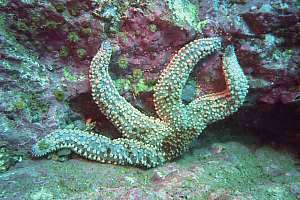 A trumpet whelk devours one starfish arm in a very short time, and entirely. Perhaps it needs the calcium to build its heavy shell with. 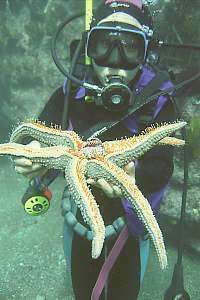 In our aquariums we observed an eleven-armed star being eaten, one arm at a time until only one arm remained, and this was eaten too.